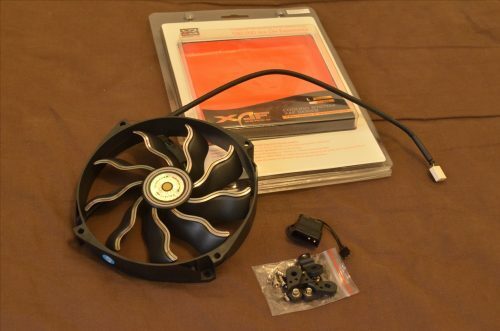 The Xigmatek XAF series of fans features a new wave like blade technology that is promoted and claimed by XIgmatek themselves to be able to push more air while still maintaining a relatively quiet operation. Is this new technology simply a gimmick or does it really work? Read on to watch a video unboxing and review or to simply find out how the fan performs! There are a few features of the fans that are worth mentioning. Firstly, it has the ability to mount both 120mm or 140mm fan holes, allowing great flexibility for users. 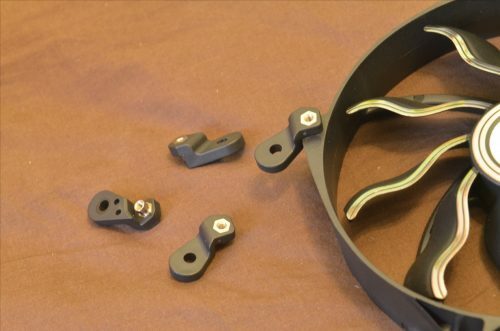 It uses this rather interesting mounting mechanic that is used to convert the 120mm mounting holes on the fan to that of 140mm. It works great and is easy to implement, so kudos to Xigmatek for such intuitive design. Another feature of the fan is that it comes sleeved with PWM support. This adds to the aesthetic appearance of the fan and with the PWM control it works fantastic for a CPU heatsink fan as it will automatically adjust itself accordingly. It is also noteworthy that Xigmatek is pushing out several different colours of the XAF series of fans, allowing you to get whichever suits your rig’s theme. Here is a simple performance test of the XAF fan I have with me on my CPU Heatsink. Instead of simply recording test values (which I lack the proper instruments to do so), I opted for a more real life performance kind of test. A prime95 small FFT test is run for 30 minutes and the temperatures are recorded. The recorded temps are then subtracted by the ambience temperature to give the delta temperatures. As seen above, the Xigmatek XAF series of fans have simply superb performance in the test done. I have to admit I was kind of shocked by its performance especially with the extremely low noise it gives. I do not have any professional audio equipment to measure the sound level it produces but from hearing with my ears, the XAF fans are as quiet as the Noctua P14 which is the quietest among all the other fans that are tested. Yes, that means if you compare the results between the XAF and the NZXT FX 140mm, the XAF has similar performance but at a much quieter operation. Whether or not the wave like blades of the fan helps in the performance I cannot really tell. However, whatever that Xigmatek has done with the XAF fans are certainly producing impressive performance. There is just one thing that I would like to point out is that the air the fan pushes from simply feeling with my hands are not that amazing to be frank. However, as the test is done with a heatsink, it probably meant that the air pressure the fan pushes the air is relatively high, thus the given performance. The Xigmatek XAF fans are great for its performance and the low noise it produces. Its attractive design and bountiful colour options simply make it a fan that is irresistible. It is currently priced at roughly $30 in Singapore while apparently going for around 14.90 euros online. At such a price point the XAF fans are within the region of fantastic fans such as Scythe’s GentleTyphoon AP-15. Nevertheless, for the aesthetic appeal as well as the great performance that accompanies with it, the Xigmatek XAF series of fans are certainly a worth considering. If going purely for a case intake fan, there are many other cheaper alternatives.